To implement these features, you edit the editWishList.php and editWish.php files. You also create a new file named deleteWish.php . 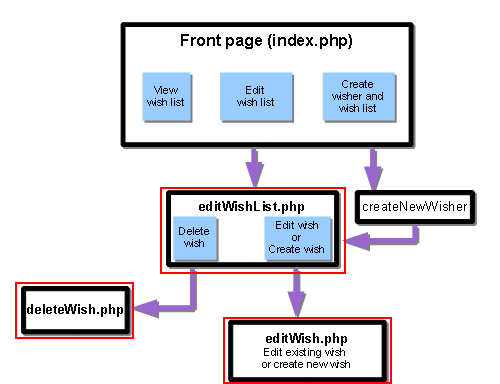 On the editWishList.php page, the user presses the Edit button to the right of a wish. The editWish.php page with the data of the selected wish opens. The user changes the description and/or the due date of the wish and presses the Save Changes button. If the description is not filled in, an error message is displayed and the user returns to the editWish.php page. If the description is filled in, the application returns to the editWishList.php page, where the wish is updated. In editWishList.php , a table with the wishes of a wisher is implemented by a loop (a while statement) that displays rows with wishes while the wishes are selected from the database. Add an Edit button as the extreme right cell in a row. 4. Fix the table row syntax. Move the row-closing </tr>\n characters from the due date echo statement to a new echo statement just above the endwhile; . Upon pressing the Edit button on the editWishList.php page, the ID of the selected wish is transferred to the editWish.php page through the Server Request method GET. To store the id of the wish, you need to add a new element to the $wish array. As when adding a new wish, the input form can be accessed both from the editWishList.php page and from the editWish.php page after an unsuccessful attempt to save. The cases are distinguished by the Server Request method through which the data is transferred. 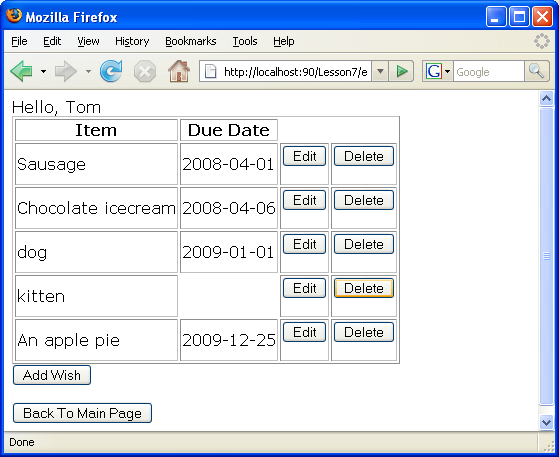 GET indicates that the form is displayed when the user first gets to the page by pressing Edit Wish. POST indicates that the user is redirected to the form after attempting to save a wish without a description. In editWish.php , replace the PHP block in the HTML <body> above the EditWish input form with expanded code for the $wish array. The code initializes the $wish array with three elements: id , description , and due_date . The values of these elements depend on the Server Request method. If the Server Request method is POST, the values are received from the input form. Otherwise, if the Server Request method is GET and the $_GET array contains an element with the key "wishID", the values are retrieved from the database by the function get_wish_by_wish_id. Finally, if the Server Request method is neither POST nor GET, which means the Add New Wish use case takes place, the elements are empty. The preceding code covers the cases for creation and editing wishes. Now you need to update the input form so that it can be also used for both cases. Now you need to update the code that verifies the input data and inserts the wish to the database. The current code does not distinguish between creating a new wish case and updating an existing one. In the current implementation, a new record is always added to the database because the code does not verify the value of the wish ID transferred from the input form. If the transferred element "wishID" is an empty string, create a new wish. Otherwise, if the element "wishID" is not an empty string, update the wish. Add the update_wish function to db.php . Add the get_wish_by_wish_id function to db.php . The code checks that the wishID element in the $_POST array is not an empty string, which means that the user was redirected from the editWishList.php page by pressing the Edit button and that the user has filled in the description of the wish. If the check is successful, the code calls the function update_wish with the input parameters wishID , description , and dueDate. These parameters are received from the HTML input form through the POST method. After update_wish is called, the application is redirected to the editWishList.php page and the PHP processing is canceled. Edit the fields and press Back to the List. The editWishList.php page opens but the changes are not saved. Now that you can create, read, and update wishes, add a method for deleting a wish. Add a delete_wish function to db.php . To check that the functionality is implemented correctly, press Delete next to any item on the editWishList.php page. The item is no longer on the list.